We’d love your help. 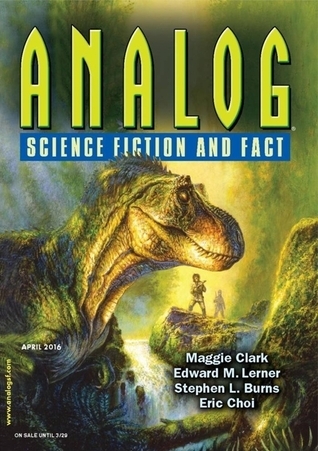 Let us know what’s wrong with this preview of Analog Science Fiction and Fact, April 2016 by Trevor Quachri. To ask other readers questions about Analog Science Fiction and Fact, April 2016, please sign up. Lucky for me, I like the longer stories a lot better than the short ones this time around. Maggie Clark's "Seven Ways of Looking at the Sun-Worshipers of Yul-Katan" is a space opera that was an interesting read, but ultimately felt incomplete, like it was the setup to a novel rather than a complete story. An alternate universe of many planets but one basic, human species scattered among the stars. Yul-Katan Sun worshipers aspire to enlightenment, success rewarded by first the trip to a space stat Lucky for me, I like the longer stories a lot better than the short ones this time around. An average issue, the last story was excellent though. “Soap An average issue, the last story was excellent though. Rather depressing non-fiction piece claiming that science is dying out and will be replaced by a science-less science, which is simply an analysis of trends in BIG data blocks, often badly measured. Disliked it - I don't think it will happen that easily. People realize that "sciences" that are using analysis of large data sets to derive trends publish too many irreproducable results. I don't think the method will become popular. A fiction story about using something like the 25rd frame (in this case inaudible speech, which nonetheless affects the human unconscious) in TV advertisement for indoctrination of the audience into buying certain soaps and detergents. The protagonist is trying to discover what causes the increase in the purchases, in order to assist the TV studio company to charge more for advertisements. In the process he helps a young pretty actress to get away from the unwanted attention of the antagonist (the owner of the powerful soap and detergent company that launched the advertisements). When the protagonist discovers how the indoctrination is done, he neither tries to save the people, nor to tell them about it. He simply applies the newly discovered indoctrination method to give himself an extra push and invite the girl to a date. Hmm, what am I suppose to make out of this? It tells me - there is nothing wrong in indoctrinating people using secret methods of psychological influence. Anyone - the bad guy, the good guy - anyone will apply it to me and you as soon as they can. A short fiction story in which a brilliant young maths geek decides to cheat his future himself. Makes me think... why should I do something just because I promised? Isn't it much nicer to cheat the other person? To grab all goodies right away under their nose and have fun right now. Why not? I won't even worry that the person whom I knowingly cheat is myself, i.e. my true I from twenty years in the future. Well, if you find joy in this way of thinking - the story will certainly be a delight for you. This non-fiction piece is my favorite unfavorite in this issue of Analog. It's all about the shortcomings of quantum physics – how bad it is that it does not offer a “logical” description of the type that would please the author. The most important inadequacy of this strange field of physics according to the author is the statistical behavior of the quantum objects. Strange that the statistical behavior of non-quantum objects, such as dice, coins, roulette, etc., does not seem to bother the author. What a pity that Analog did not solicit a contribution from an expert in the field. Touching lively characters, but unconvincing storyline. I would still rate this very short story as my favorite in this issue of Analog. All in all - this issue was disappointing for me . OK. A girl moves away from Yul-Katan and it's sun worshiping ways to become a scientist. Many years later an expedition she is on comes across a lifepod that contains a body from her home world. Shortly after rescuing the lifepod another group demands it after having killed four members of the expedition. The survivors want to know what happened, but they also want to live. Very Good. William is chief engineer for a radio station in 1932 and has to bow to the whims of a sponsor, playing prerecorded ads for the one soap opera. He is immediately attracted to one of the actresses, Clara, but so is the powerful, won't take no for an answer, sponsor. LOL at "Who is who?" Good+. Jason is brought in to do some experiments with a computer. Leaving him to figure out their purpose. Good. A man is visited by his future self, telling him this is the night he broke up with Gwen and he's regretted it for twenty years. Good+. Abdoulaye and Safi are working at the sleep factory almost at the point where they can quit and move. OK/Good. Terry Jospin has a prosthetic hand. As an ex-baseball player it rankles him to the point of affecting his family. Good. Marty and Julianna take a trip back to Cretaceous Antarctica to do research and get some good footage for their bosses and to also keep an eye on Sid James and Derek Dill. They need to ensure that Diamond Jim doesn't create an environmental travesty. Meanwhile their bosses might put profits ahead of danger, too. Very Good/excellent. John Blank is a cop in a class based society. He's a class D citizen. While on duty his every move is recorded, he is required to take a drug that makes him stay in line. He is investigating the deaths of several regulators. Class C citizens that do the dirty work for the higher classes.